In June 2004, Elizabethtown Fire Department and Lisbon Fire Department were dispatched to a call of a man trapped in a grain silo. Seven different fire departments responded to the scene and the rescue took all day, according to reports. 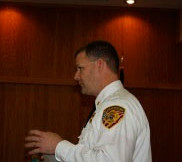 Elizabethtown Fire Chief, Nick West explained to the Elizabethtown Rotary Club on Wednesday a new piece of equipment the department obtained to assist the trapped in rescue calls. The department has expanded its rescue capabilities by adding a grain bin rescue tube to its equipment. The grain bin rescue tube was obtained with assistance from Farm Bureau. The rescue tube helps firefighters to relieve the pressure of the grain pressing against the victim and to help remove the grain surrounding the victim. Another added service at the fire department is the capacity to do car seat checks and is considered a permanent check station for the County of Bladen. Residents can stop by the fire department located on Swanky Street Monday through Friday between hours of 8 a.m. and 5 p.m. to have their car seat inspected or receive assistance with installing the car seat. Last but not least the local fire department founded a local chapter of the Firefighters’ Burned Children Fund, Inc. Chief West said the department is selling Challenge Coins for $10 each to help the fund. The department also has a trailer to collect aluminum cans located across the street from the fire department. The cans are recycled and funds raised are used to assist burn victims. 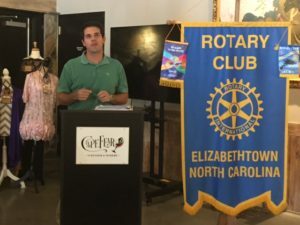 Rotatrian Michael Leiwand, chairperson for the Annual Rotary Golf Tournament announced the fundraiser will be in the spring this year. The date of the event is to be determined. The golf tournament is a fundraiser to assist the club with their annual scholarships for Bladen County students. If you are interested in the Elizabethtown Rotary Club you are invited to join them for lunch. The club meets on Wednesdays at 1 p.m. at the Cape Fear Vineyard and Winery.